She’s too busy to confirm anything, but my first thought was not ‘where are you?’ (that was her Mom), but Wow! How nice to be young and reckless. Obviously, I am the grandma and we grandma’s know its good to have fun when you’re young. You can pay for it later with the various aches broken bones leave. Not that she’ll break anything, but I have broken a couple of things with regard to horses. My kids still laugh at the memory of me on an Appaloosa https://en.wikipedia.org/wiki/Appaloosa who had a bad habit of scraping riders off his back by passing under a low tree branch. He did this to me one day by running under a Pine. I grabbed a low-lying branch and dropped neatly to the ground, my only discomfort caused by the pine tar all over my hands. Another time, he took a sudden V-turn and his saddle slipped, leaving me lying on the ground stunned. I hurt all over, but my only broken bone was a pinkie finger. Joy is now 21 and able to live her life without much parental guidance. Girls who can do anything boys can do, have never had it so good. 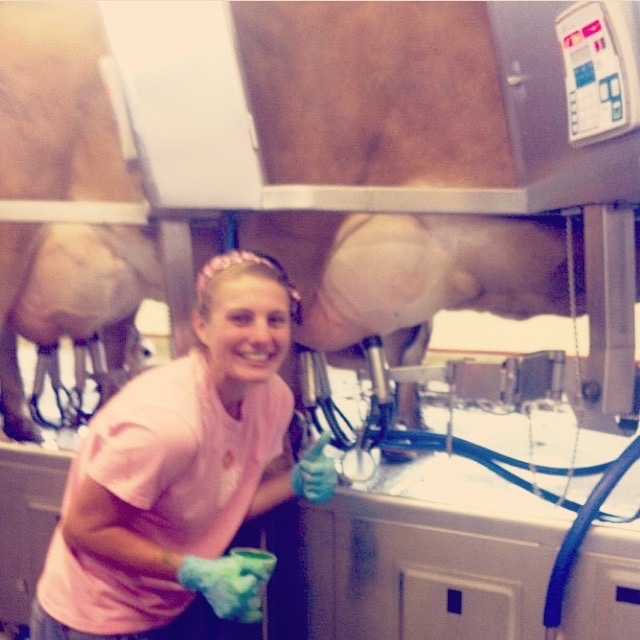 She’ll graduate next summer with her degree in Agricultural Science and we usually get photos like the one below. This entry was posted in Accidents, Education, Environment and Nature, Family/Children by SchmidleysScribblins. Bookmark the permalink. My sister has horses. My daughter gave it up after falling on her head…..
A super post with tales of your granddaughter and memories of you on a horse. That was one mischievious horse by the way. The photos are great. Thanks Denise. Joys friend took these photos. Both are cute pictures. My grandson is only 16 but he is up and gone for all purposes. I guess as long as I get cute pictures, I’ll be happy. I hope so? Joy is visiting me in July. I see her 2 or 3 times a year now. When she was little she spent every other weekend with us. Your updates on Joy fill me with, well, joy. She is so full of life. Grandchildren are gifts, even to grandmothers not their own. Hi Linda. Yes they are gifts and wonderful too. I only have one daughter, so the four granddaughters are like daughters. Hence my reference to Connie as one of the girls. To me she will always be my child. Currently she’s been going through the empty nest thing as Joy is the baby. Re Joy…she is as delightful as her photo suggests. She brightened all our lives and helped us survive some tough times including the death of her biological father. Everyone who meets her loves her. She has one more year of college to finish her undergraduate degree and already has job offers. Now she must choose between grad school and work. Tough choice! 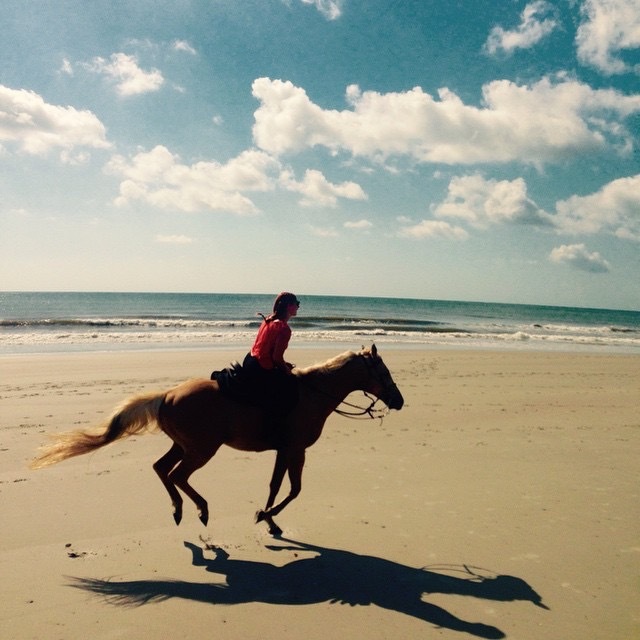 Granddaughter Hannah tells me horses are only big dogs…..ah the Islands in the Caribbean! Wonderful places. What fun to have sons with horses. I rode a horse a few times, but never fell off, though the rides were difficult. No thought of going back on a horse. Nice photos. Joy’s friend is an excellent photographer. No, I wouldn’t get on a horse again either. Didn’t you ride an elephant last year? Yup. I rode an elephant in India in 2012.